Brands aren't waiting for Pokémon Go to activate its promised in-game advertising, not when the craze is white-hot today -- and could burn out tomorrow. Marketers from T-Mobile to Simon Malls are capitalizing on the smartphone game, which sends players roaming the real world to catch virtual creatures like Jigglypuffs and grab virtual objects. Niantic, the Google spinoff that developed the game, says it will let marketers pay to become locations that will attract players. It will charge marketers by the visit, the way search ads charge per click. The McDonald's name and logo are already embedded in the app's Android code, observers said last week, as Gizmodo reported. But there was no sign of sponsored locations in the game yet, or of negotiations to sell them. On Friday, McDonald's declined to comment. Niantic did not respond to requests for comment. Marketers were left to improvise, or else potentially miss out on a phenomenon so big that 5.9% of Android users in the U.S. played it last Monday, according to SimilarWeb, an analytics company. Yelp added a feature to let consumers find restaurants or stores that have nearby PokéStops, the locations where players scoop up in-game goods. T-Mobile will use its T-Mobile Tuesday promotion this week to exempt the game from data charges for a year, provide $15 Lyft rides to key locations and offer discounts on chargers and battery packs—a nod to the game's notorious battery drain. Rival telco Sprint and its Boost Mobile brand are inviting people to their local stores to capture Pokémon Go characters, which they promised to attract by purchasing the game's "lures." They also dangled on-site "Pokémon Go experts" and free charging stations. Simon Property Group has been promoting its malls with PokéStops via social media and is looking into the idea of sponsoring locations. "It's adding a layer to the shopping experience that everyone is looking for," said Gabriella Santaniello, president of retail researcher A-Line Partners. "Mall traffic has died down because it's boring and sterile, but this is something all-encompassing that makes the mall more exciting and social." Because many players will use the mall's Wi-Fi, and are often required to include their email addresses to do so, there's an opportunity for data collection as well, she added. JC Penney is not only considering using lures to drive traffic but also promoting its Pokémon merchandise, a spokeswoman said. Real estate site Trulia, meanwhile, built maps of the most likely places to find certain kinds of Pokémon. 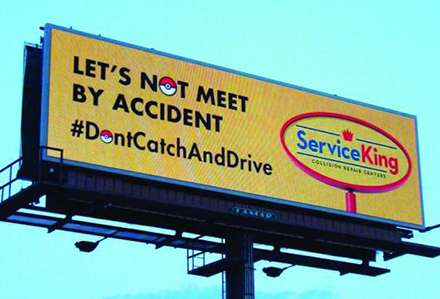 The Service King auto repair chain and agency Blue Fountain Media updated the brand's digital billboards in 20 markets to read "Let's Not Meet by Accident -- #Don'tCatchAndDrive," with Poké Balls standing in for the letter O. Even Hillary Clinton latched on. "I don't know who created Pokémon Go, but I'm trying to figure out how we get them to have Pokémon go to the polls," she joked during an event last Thursday. The campaign also scheduled a voter-registration event at a PokéStop in Ohio. Not every brand should be a PokéMarketer. Alcohol brands have advertised in Snapchat, but are staying out of Pokémon Go. "We're very mindful of ensuring the people we're reaching are of an appropriate legal drinking age," a Heineken USA spokesman said. Then again, booze-subscription app Froth organized a bar crawl in New York last Thursday, encouraging attendees to hunt Pokémon in and around the selected establishments. The bars visited were located strategically near PokéStops or PokéGyms and, conveniently, the first drink at each was on the house for Froth users. The 20 or so attendees did their hunting while en route from one bar to another. The event featured several Pokémon-themed details, including free Ash Ketchum hats and fruity red Pokéball cocktails. A number of small businesses have taken advantage of the app's popularity in a similar way -- that is, by purchasing lures and watching potential customers pour in in search of Pokémon. The ad agency Huge bought lures last week for its Atlanta cafe. It's anybody's guess how big the game will remain over time, but marketing opportunities will likely extend beyond sponsored locations. Mortimer Singer, CEO at consulting firm Marvin Traub Associates, predicted that it will incorporate mobile commerce using digital payments. "If you take this Pokémon Go thing forward, you're a participant in your own retail theater," he said. "It'll go beyond just marketing, it'll be able to activate sales." 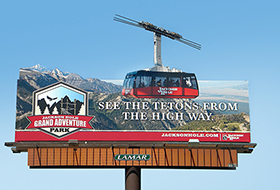 Lamar Advertising Company (Nasdaq: “LAMR”) will release its second quarter ended June 30, 2016 earnings report before the market opens Tuesday, August 9, 2016. Lamar will host a conference call on Tuesday, August 9, 2016 at 8:00 a.m. (central time) to discuss the Company’s results and answer questions relating to company operations. Thanks to cheaper gas prices and an improving economy, Americans are back on the road, searching for tourist attractions and road trip memories.